oshyn: OpenText™ Content Server & Management Server Integration - Open Text Web Solutions Usergroup e.V. 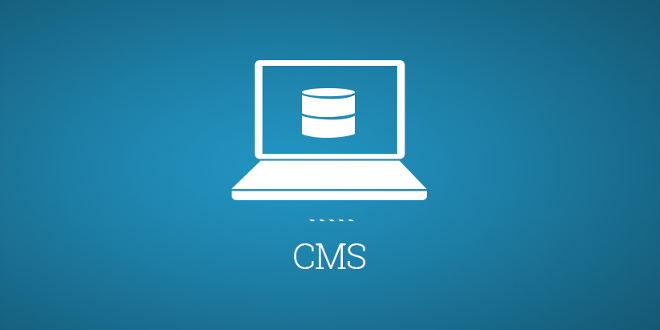 OpenText Content Server is a robust, yet very flexible Enterprise Content Management System. It offers great functionality when searching for information that has been loaded into it. This information includes documents, folders, discussions, and other Content Server items. Searches can be as simple or as complex as you need. They can also be based on the item’s content or on metadata that has been defined for each of the loaded objects. Better yet, this behavior is now accessible from OpenText Management System. You can now integrate documents from the Content Server repository into your CMS projects and look for them using all of the search capabilities offered by Content Server. To use this functionality, OpenText offers a connector between Content Server and Management Server called the Native Bridge to Livelink 10.0 or Livelink DM Interface. Because it supports earlier versions of Content Server, under the name Livelink ECM – Enterprise Server, the name Livelink DM Interface is still retained in the software and the documentation provided. In Content Server, you manage your documents as usual. 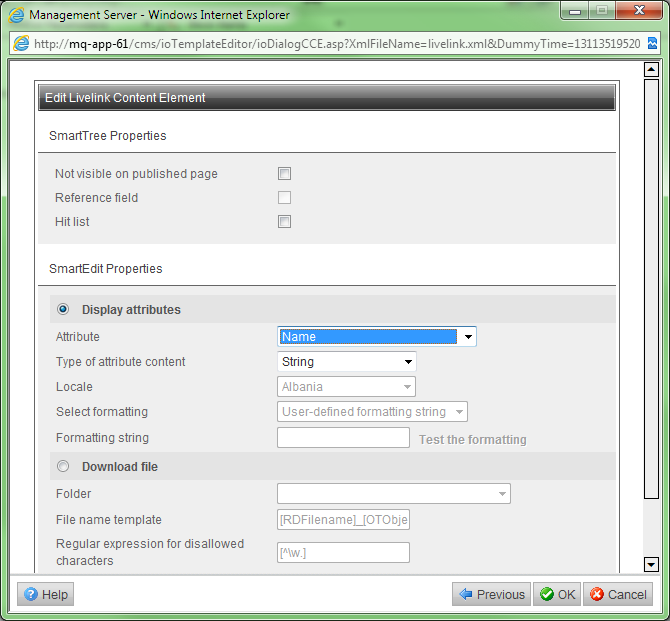 You use the SmartEdit and SmartTree user interfaces in Management Server to create and maintain your Web site. Livelink DM Interface allows the convenient integration of documents from the Document Management System into your web site. You can access documents through the Content Server Web interface, which is integrated in the Management Server workflow. When using documents from Content Server, you can decide how the documents are to be integrated. You can make the document available as a copy (current snapshot) in a published folder of Management Server. Alternatively, a link (secured link) to the document in Content Server is created on the published page. In addition to the integrated documents, the metadata of the documents can also be displayed in the web site. 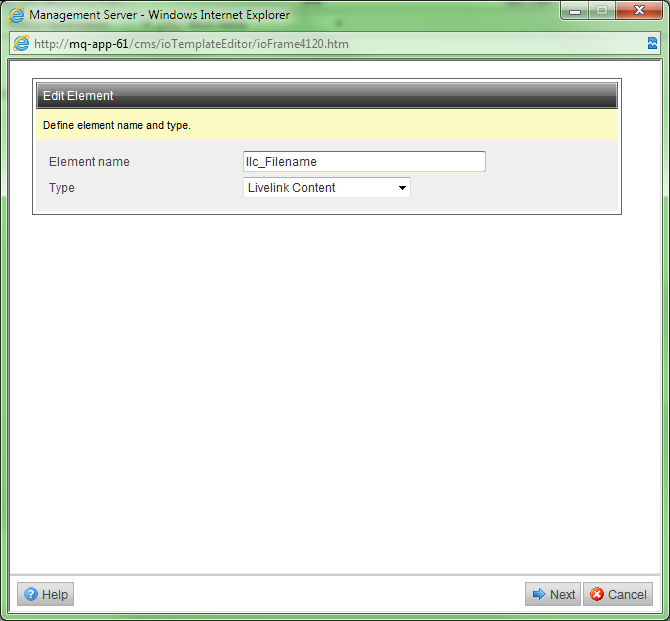 Customize Management Server: Use the installation program to help you import the Connectivity Interface and Livelink Content element. 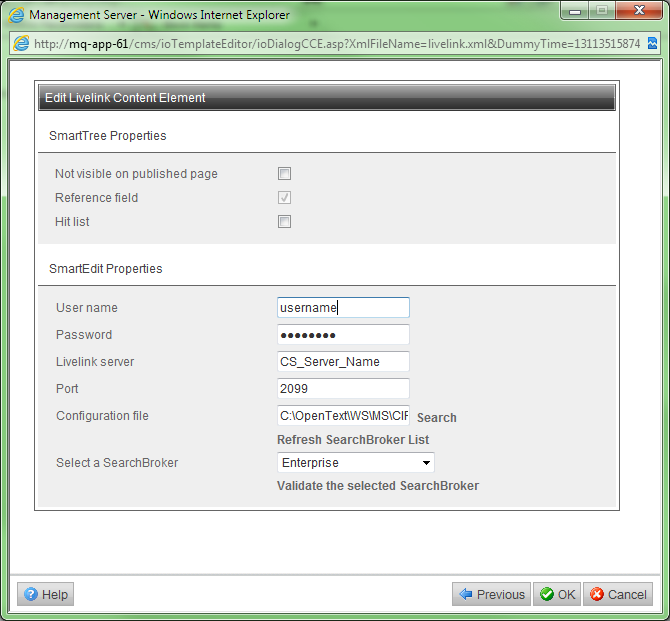 Customize Content Server: Install the Livelink module on Content Server and expand the database accordingly. For information please refer to Installation section in the documentation provided as part of the module’s downloadable file available here. The Livelink Content element which can be inserted in any of your Content Classes defined in Management Server lets you run a search for documents that are managed in Content Server. 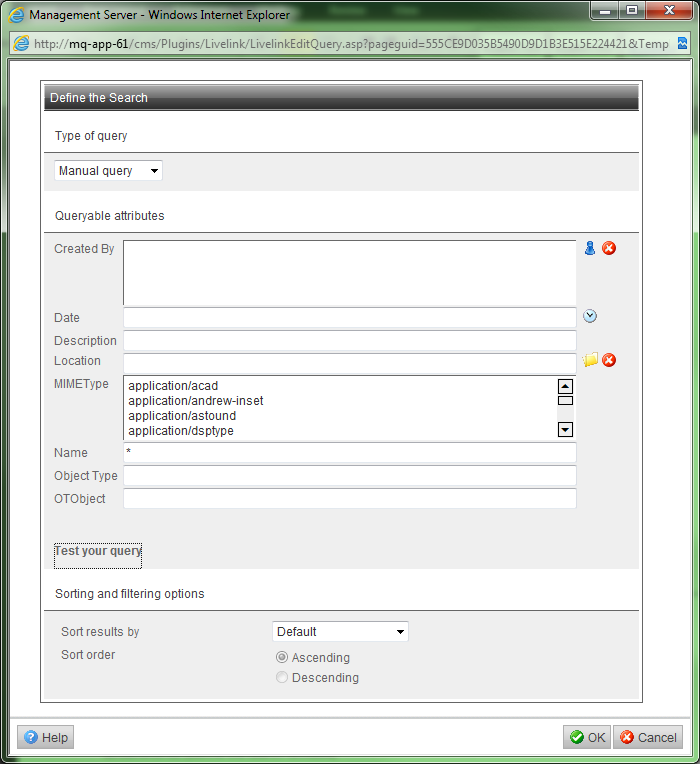 Using a complex query in LQL (Livelink Query Language). Depending on the search settings, the search result is returned as a list of available documents. In a content class, create a Livelink Content element (reference element) where you enter the data for accessing Content Server. You must edit two dialogs. Create a Livelink Content element to be able to display a document attribute in the search result on a published page or to make a link available in the search result for downloading the document that was found. Insert this Livelink Content element in your template. You can create multiple Livelink Content elements in one template. To create these Livelink Content elements, you will need to edit two dialogs for each. Note: The Database Query block mark can only be used once in each template; but the block mark may contain several Livelink Content elements. To have the search results displayed, create a page based on the content class in which the Livelink Content elements are defined. Define a search query using the page previously created. To view the search results on a published page, select Show Page Preview in the Action Menu. Livelink DM Interface enhances the functional value of your site by making the latest documentation available immediately to your website’s visitors.